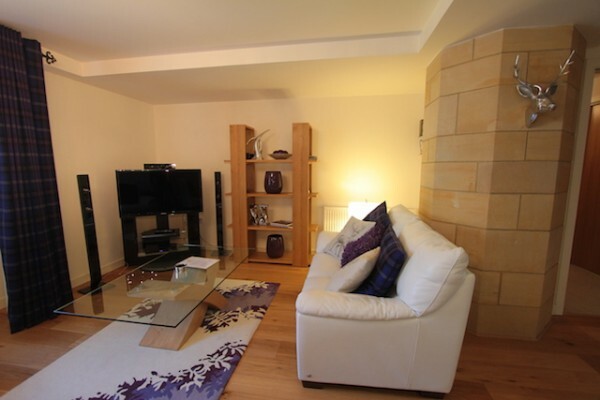 The ‘Averon’ apartment is a beautifully decorated and furnished two bedroom apartment and benefits from being on the 1st floor of the Abbey Church Building in the Highland Club where you will find the swimming pool and spa facilities (sauna & steam room). The historic Cloisters walkway links the Abbey Church with the rest of the Monastery, Loch Ness and its facilities. Averon has a lovely blend of both modern and traditionally Scottish decoration and would be a lovely place to spend your holiday or short break. 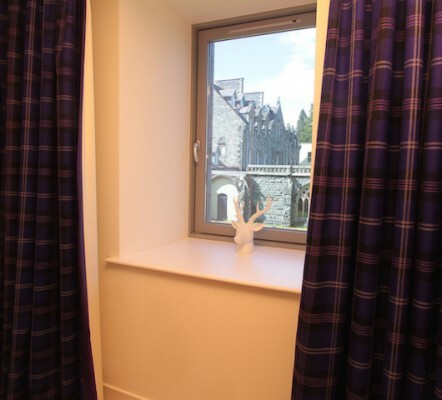 The whole apartment is beautifully co-ordinated and has the original stone pillars throughout, one of the best equipped apartments in Fort Augustus Abbey. In the large open-plan living area there are two white leather settees and one of these doubles up as a comfortable sofa bed allowing sleeping of up to 6 people. 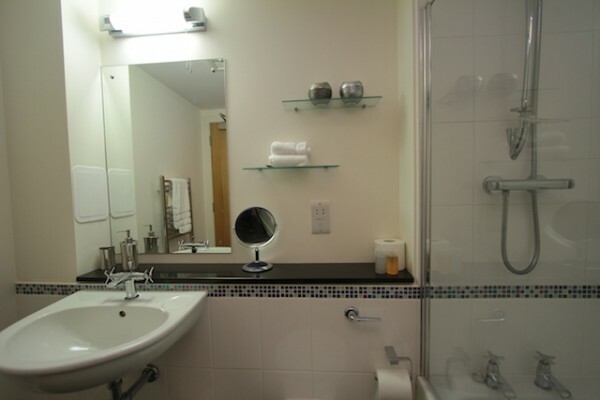 There is also a large flat-screen TV with a superb surround sound system for you to enjoy. The glass dining table allows seating for up to six people with matching white leather chairs. The stylish kitchen has granite worktops and is fully fitted with electric oven, gas hob, dishwasher, microwave, washer/dryer, Tassimo coffee maker (please bring own pods) and a full compliment of high quality kitchen equipment and utensils. In the large master bedroom suite you will find a king-size white leather bed, comfortable leather chairs and solid oak furniture, including a wardrobe and chest of draws. There is a flat screen TV and radio alarm with IPOD Doc. The Scottish ‘family tartan’ curtains throughout the property are beautifully complimented by the bed throws and cushions in each of the rooms. 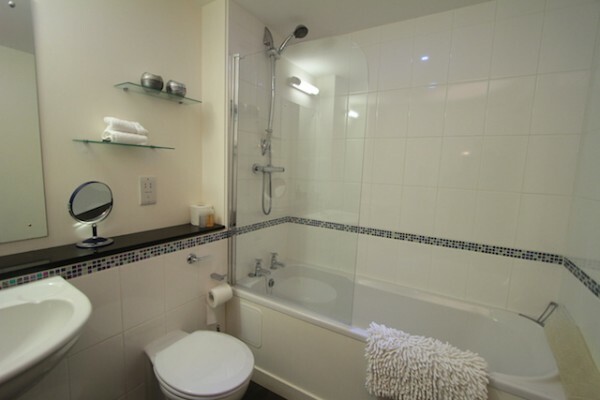 The en-suite bathroom to the master bedroom has both a bath and a separate powerful shower. 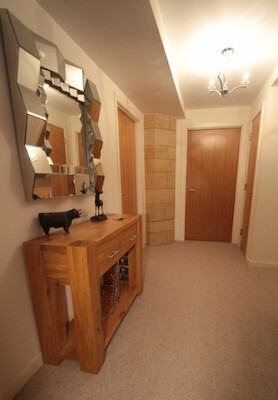 The second bedroom has matching twin beds with a solid oak chest of draws and bedside cabinets, the adjacent second bathroom benefits from a bath and a powerful shower above. All quality towels and bedding are provided. Spend Christmas New Year in Scotland this year or try a New Year break at Loch Ness in this wonderfully equipped apartment.